If you have a defective aircon in your home, you may not enjoy the pleasant experience that you need. Most of the time, you may have this bad experience due to lack of aircon servicing. In most instances, the professional that you hire may ignore some of the things that bring constant problems to your machine. This means you will get the problems again and again. 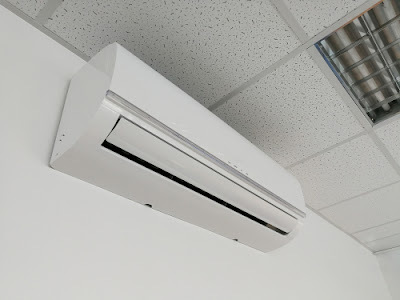 But by keeping your aircon in good shape you’ll not only save money but also extend its lifespan thereby saving you on costly early replacement. Here are some of the top aircon serving tips. One of the most important aircon maintained chores is replacing or cleaning your aircon filter. This should be done regularly during the high use season and once during a fall or spring. Here is how to clean aircon filter. · Open the air conditioner- Before doing anything, you need to ensure that your air conditioner is turned off. Once this done, use a screwdriver to carefully remove the parts. · Remove the filters- First, inspect the filters for any serious signs or wear and tear. If you see any snags or rips don’t even bother yourself with cleaning. The best thing to do is to replace them since using them may affect their efficiency. · Vacuum- If you don’t need to replace your filters then use a vacuum to get rid of accumulated grime and dirt. For effective cleaning results, ensure that you do the job properly. However, you need to be very careful as you might end up puncturing or tearing the filter. Remember, any tears usually render the filter ineffective. · Sanitize the filters- Fill the basin with equal portions of vinegar and water. Ensure that the basin is large enough to fit the filters. The vinegar is basically used to kill allergens and any harmful bacteria that may have accumulated inside there. · Soak the filters- Allow the filter enough time to soak in the solution. If you don’t clean them regularly then you should allow them to soak for at least 4 hours to ensure that they are properly sanitized. However, if you have only used them a few times then a one hour of soaking is just enough. · Drain- Remove them out from the water solution and allow the solution to drain out. However, avoid rinsing them since this might reverse the process. Instead, place them in an old clean towel to absorb the excess solution. While still in the towel, allow them to dry naturally. It’s advisable to place them where the sun is available or just outside in the yard. · Fit the filter back- Finally, fit the filters back and replace any component that you may need to replace. 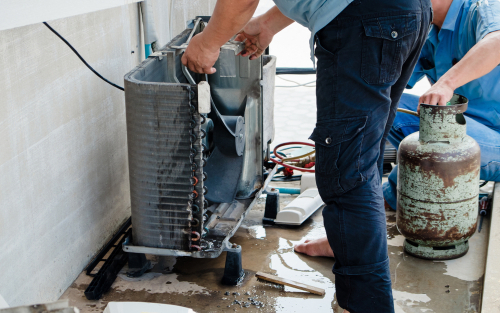 Apart from cleaning the filter here are other aircon maintenance tips that may help you. · Check out the wiring component- Before working on your aircon, you need to turn off the wiring unit. Next, check whether there are any signs of overheating such as burned and blackened wires, melted insulation on wires among others. Apart from this, check out any electrical connection to see whether they are tight or not. If you see any of these signs then call in professional to help you. · Examine thermostat- Inspect the thermostat to ensure that it’s working well and can keep your home at the right temperature. 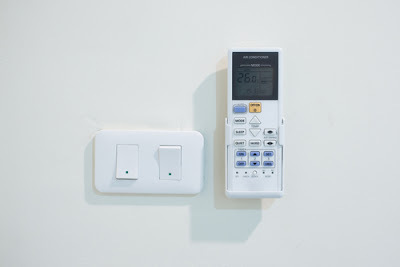 If you have a mechanical type thermostat, you need to upgrade into the modern one which is programmable. A programmable thermostat will enable you to set the temperature high and cool the home when you need to. By doing this, you’ll ensure that you go to comfortable home. · Clean the outside unit- Over time grass clippings, leaves, or dirt may build up on the system thereby reducing the air flow and capacity. After putting off the power, use a garden hose to gently remove the debris. However, avoid using a power washer. · Fix any leaks- Ducts can always lose a lot of air flow through the leaks. You need to use the old smoke tricks to find the leaks. For window units, light a stick and hold it where the window and the unit meet. If the smoke comes out then it means there is a leakage. You can then go ahead and seal them with foil tape. However, for window AC use staff foam in between. · Clean the evaporator coil- On the furnace, unit look for evaporator coil. You may need to take out few bolts and screws and then use a soft brush to brush off the coils. Next, clean the drain pan with water, soap, and little beach. To ensure that the coil remains clean for long, place a drain pan tablet on the pan to inhibit algae growth. Properly cleaning and maintaining your aircon conditioning unit will not only save you lot of money but also keep your house comfortable during the hottest days of the year? If you can follow these aircon servicing tips then your aircon machine will keep on working for a long time. If any of the components is not working properly, check out whether they can be serviced at home or it’s important to hire professional. Thoroughly examining, servicing and cleaning your aircon will decrease the chances of any problems occurring in future.